Blake, aged two, for a few days was starting to creep me out a bit in the "I see dead people" kind of way! He kept talking about the yellow boy, and would say things like the yellow boy is upset, sad, scared, hiding and in my bed! It was a bit puzzling when Blake would stop playing, gaze into an empty corner, have a one sided conversation and then say " the yellow boy is sad, mummy"
This started when we were holidaying in Wales and staying in a hundred year old cottage! 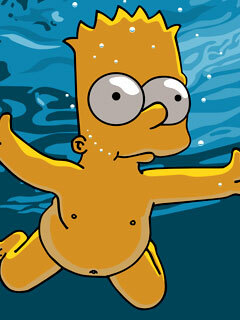 Hubby figured it out and we later confirmed the yellow boy was nothing more than Bart Simpson! ... I hope! this made me laugh! bless him. what a great imagination though!